It is an old good atmosphere. And work and wood taste are appropriate Japanese Buddhist statue. And a statue does not separate from ZUSHI. It is rare that such a stand is attached. And this is the serious old statue that the specialist made. 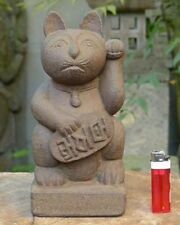 E687: VERY RARE Japanese old BANKO statue of cat with fantastic work w/box. This is made very well and is the fantastic work. And it's wonderful image of cat. Of course this is hand made. All including tone, clay and the work are appropriate then BANKO-yaki. This is the high-class statue that the specialist made. Quantity:1 Pair. GOOD QUALITY CASTING. 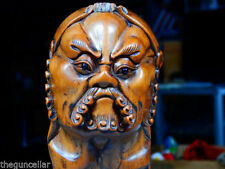 Japanese antique big mask of Tengu. Mask : Face of Tengu (天狗). __ Edo era. SAMURAI art__. I appreciate your understanding. I have a favor to you. I would appreciate your favor! Other : Not box. SPECTACULAR SIGNED SOLID SILVER EBISU GOD SCULPTURE JAPANESE TRADITIONAL CRAFT. 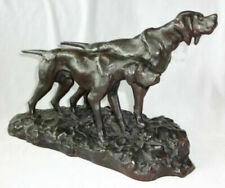 WEIGHT : THE SILVER WEIGHT OF THE STATUE IS 406 GRAMS OR 14.3 OZ . THE TOTAL WEIGHT WITH GLASS CASE AND PRESENTATION BOX IS 1373 GRAMS OR 48.4 OZ. S3890: Japanese Bamboo WRITING BRUSH Bundle sale, auto Calligraphy tool. We have collected the all kind of Japanese antiques. We are happy to understand you the matter. We will make every attempt possible to resolve the issue if we made a mistake. If there is a problem, we can work together to resolve the problem. Condition:VERY GOOD (THERE ARE USED TRACE BY AGE.). We have very good Japanese Antiques. They have age appropriate flaws. Best regards. This is "GYRO ASIAN ANTIQUE". Asia 25.00 10.00. In Japan, artwork of this deity usually shows him wearing a hood and standing on bales of rice (tawara âe¢U), carrying a large sack of treasure slung over his shoulder and holding a small magic mallet. Total Weight / 2490 g. Color / Beige. Condition : Good. We are happy to understand you the matter. Even though it happens rarely, we do make mistakes on occasion. Also to get proper amount of compensation in case of item breakage. We have collected the all kind of Japanese antiques. Get images that. 19pm-3am (EST)/9am-17pm (JPN). We will reply within 48 hours you.As soon as possible. Even though it happens rarely, we do make mistakes on occasion. We have collected the all kind of Japanese antiques. Worst two months. 19pm-3am (EST)/9am-17pm (JPN). We will reply within 48 hours you.As soon as possible. Even though it happens rarely, we do make mistakes on occasion. We have collected the all kind of Japanese antiques. Total Weight / 525 g. Color / Brown. Condition : Good. We are happy to understand you the matter. Even though it happens rarely, we do make mistakes on occasion. F188: Japanese tasty copper ware rooster and hen statue as ornament for BONSAI. This is very good work with good atmosphere. MATERIAL : Copper. AGE : About 30 years ago. SIZE Width 1.3in : Length 0.8in : Height 1.8in : Weight 2.82oz. Width 3.2cm : Length 2.1cm : Height 4.5cm : Weight 80g. __Edo era. SAMURAI art__. Mask : face of "Hyottoko (clownish mask)". Rare Japanese antique big wall decoration of mask. Material : paper & Japanese lacquer, etc. weight : 154 g. I appreciate your understanding. This is made very well and is very good work. It's fantastic painting and coloring. Of course, this is handmade. And such work is just KUTANI-yaki. Origin is a 17th century. 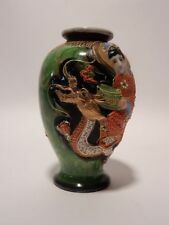 They were trained under the guidance of the ceramicist of Imari-Yaki. We have collected the all kind of Japanese antiques. Worst two months. Total Weight / 3055 g. Color / Brown. Condition : Good. We are happy to understand you the matter. Even though it happens rarely, we do make mistakes on occasion. __Edo era. SAMURAI art__. Rare Japanese antique big wall decoration of mask. Material : paper & Japanese lacquer, etc. weight : 112 g. I appreciate your understanding. I have a favor to you. Other : Not box. We have collected the all kind of Japanese antiques. Worst two months. We will reply within 48 hours you.As soon as possible. Even though it happens rarely, we do make mistakes on occasion. We will make every attempt possible to resolve the issue if we made a mistake. Weight 65g/ 2.29oz. (It's the weight of two). 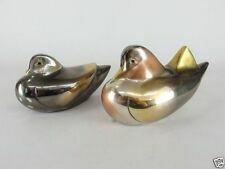 A pair whale has silver sculpture. ■Size of a whale. Material ：Silver. Age Unknown. Good condition. This is Original. We have very good Japanese Antiques. They have age appropriate flaws. Best regards. This is "GYRO ASIAN ANTIQUE". Asia 45.00 -. We have collected the all kind of Japanese antiques. The item has a Wooden box. Total Weight / 865 g. Color / Brown. Condition : Good. We are happy to understand you the matter. Even though it happens rarely, we do make mistakes on occasion. __ Momoyama ~ Edo era. temple samurai art __. Rare Japanese antique candle stand. Candle holder. Material: Iron. Material : iron. I appreciate your understanding. I have a favor to you. We have collected the all kind of Japanese antiques. Total Weight / 1835 g. Color / Green. Condition : Good. We are happy to understand you the matter. Even though it happens rarely, we do make mistakes on occasion. We have collected the all kind of Japanese antiques. Color / Beige. Also to get proper amount of compensation in case of item breakage. Even though it happens rarely, we do make mistakes on occasion. Total Weight / 1175 g. Color / Brown. Condition : Good. We are happy to understand you the matter. Even though it happens rarely, we do make mistakes on occasion. Also to get proper amount of compensation in case of item breakage. We have collected the all kind of Japanese antiques. We will make every attempt possible to resolve the issue if we made a mistake. Custom declaration. If there is a problem, we can work together to resolve the problem. We have collected the all kind of Japanese antiques. We are happy to understand you the matter. Color / Black. We will make every attempt possible to resolve the issue if we made a mistake. Also to get proper amount of compensation in case of item breakage. I putted a Buddha statue in a chest of yoroi when go in the battlefield. __ Momoyama ~ Edo era. Samurai art __. Very rare Japanese antique small buddha statue of Fudo-Myoo in Zushi case. Buddha statue to bring to the battlefield. DESCRIPTION This is Bronze 2 quail ornament. Roundness and loveliness are well expressed. SIZE 9.7cm(inch)×11cm(inch)×7.2cm(inch) 15.8cm(inch)×12.5cm(inch)×7cm(inch) total weight: 2491g (ornament:1950g) Condition: used / There are a some scratches. Antique Japanese Handmade Copper "3 NO" Monkey No look,No Speak,No Listen Statue SIZE Width: 40mm/1.58 inch Height: 40mm/1.58 inch All the photo of the item is natural-color image, no any changing!. __ Edo era. SAMURAI art __. Rare Japanese antique Hoju (Buddhist Gem) with marked. Hand carving. Lucky charm. / Rise in life. / Grows up big. But feel free to ask i will try the best i know to answer. Rare Japanese antique a shakujo (Bosatsu shakujo). warlord have used substitute Shakujo for Saihai on the battlefield. Shakujo: a stick used by a priest or an ascetic Buddhist monk. __ Edo era. samurai art __. We have collected the all kind of Japanese antiques. Color / White. Condition : Good. Also to get proper amount of compensation in case of item breakage. Worst two months. Cost Mapping. Custom declaration. Exquisite pair of antique TURQUOISE BUDDHIST LIONS ceramic Japanese "Foo dogs"
A stunning pair for your antique Asian ceramics collection! I always try to descibe the condition of the item. I always try to give an honest and complete discription of the item and add a lot of detailed pictures to prevent confusion about the condition of the item. We have collected the all kind of Japanese antiques. /s3gt_tooltip. css" rel="stylesheet" type="text/css" />. 19pm-3am (EST)/9am-17pm (JPN). We will reply within 48 hours you.As soon as possible. Even though it happens rarely, we do make mistakes on occasion. Size : W 28 × H 31 [ cm ]. A very fine Japanese bronze elephant of the Meiji period signed, having raised trunk, bone tusks, signature plaque measures 8.25” high, 10.5” wide, very well done. The elephant is walking with trunks raised symbolically in a good fortune and luck position. Marked to the bottom with maker's mark. In excellent condition! Weights ~ 1783 grams. For sale is a beautiful Japanese Okimono Elephant Sculpture.